UIU alumni Steve ’73 and Diane ’73 (Kinkead) Harms of West Des Moines, Iowa, have donated $750,000 to the Upper Iowa University and City of Fayette $1.15 million Recreation Center Project. In addition to the communitywide impact, the project will provide significant benefits to both traditional UIU students and student-athletes. A pair of alumni have provided their alma mater with a healthy start on the Upper Iowa University and City of Fayette $1.15 million Recreation Center Project. 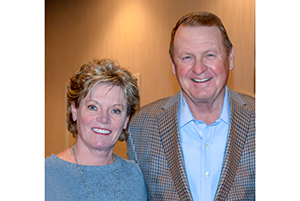 Steve ’73 and Diane ’73 (Kinkead) Harms of West Des Moines, Iowa, have donated $750,000 to the improvement project, which will benefit both the rec center and indoor pool located at UIU’s Fayette Campus. In addition to the communitywide impact, UIU Athletic Director Rick Hartzell noted the significant benefits the new flooring and rec center enhancements will provide to both traditional students and student-athletes. The Rec Center was constructed in 2001 and includes a weight and fitness room, UIU’s wrestling facility, a group fitness room, an upper and lower three-lane track, ceiling-suspended batting cages, male and female locker rooms with showers, and basketball, volleyball, tennis and badminton courts. The renovations include enhancing the surface throughout the 40,000 sq. ft. facility with multipurpose flooring and upgrading the HVAC system to include air conditioning throughout the building. Constructed in 1920, the pool is located in the basement of the Edgar Fine Arts building at Fayette Campus, featuring four 20-yard lanes and a variety of recreational and aqua workout equipment. The pool area will be enhanced with upgrades to water filtration and chemical storage, in addition to renovations to the pool walls and decking. In addition to the Harms’ gift and over 150 other private donations, the University has secured a $30,000 contribution over three years from the City of Fayette and a $5,000 pledge from Fayette County. Recently, Andrew Wenthe, UIU Vice President for External Affairs and Mayor of Fayette, presented a grant proposal to the Iowa Economic Development Authority Community Attraction and Tourism (CAT) Board seeking $230,000 in funding support. Wenthe emphasized that even if grant funding is secured, a fundraising gap of approximately $100,000 exists. The community’s continued support is an important criteria that the CAT Grant Board considers when making funding decisions. Community members who utilize the Rec Center are encouraged to consider a donation to this enhancement project. Donations can be made online at uiu.edu/alumni/give.html or be sent to the UIU Alumni Office at P.O. Box 1857, Fayette, IA 52142. Information about naming opportunities may be directed to Andrew Wenthe at wenthea@uiu.edu or 563-425-5348.